Please enter your registered email address and press Send button. We will reset your password and send a new one to your email. Get more from your movie-going experiences as you collect reward points and claim free tickets and popcorns along the way! Every five rupees you spend on a MidTown Cinemas movie ticket earns you a reward point. Everyone who has signed up for an account at www.midtown.com.np or through our mobile app becomes a part of the MTC Advantage program. Use the MTC Advantage Virtual Card built into our mobile app to accumulate and keep track of your reward points. You will be notified of the rewards you have earned from the app itself. Make sure you present your MTC Advantage Virtual card while purchasing your movie tickets! Sign up for an account at www.midtown.com.np (you can also create your account from our mobile app). Make sure you present your MTC Advantage Virtual Card at the time of purchasing your movie tickets at our box offices. For online purchases, your reward points will automatically be credited to your account. Our mobile app will help you keep a track of your reward points and notify you as soon as you are eligible for any rewards. Use the mobile app to redeem your rewards at our box offices and concession counters. As you level up, your rewards will grow bigger and come faster! Get more from your movie-going experiences as you collect reward points and claim free tickets and popcorns along the way! Every five rupees you spend on a MidTown Cinemas movie ticket earns you a reward point. Use the MidTown Cinemas mobile app to keep track of your reward points and get notified as you accumulate rewards, progress along different levels and increase your benefits. 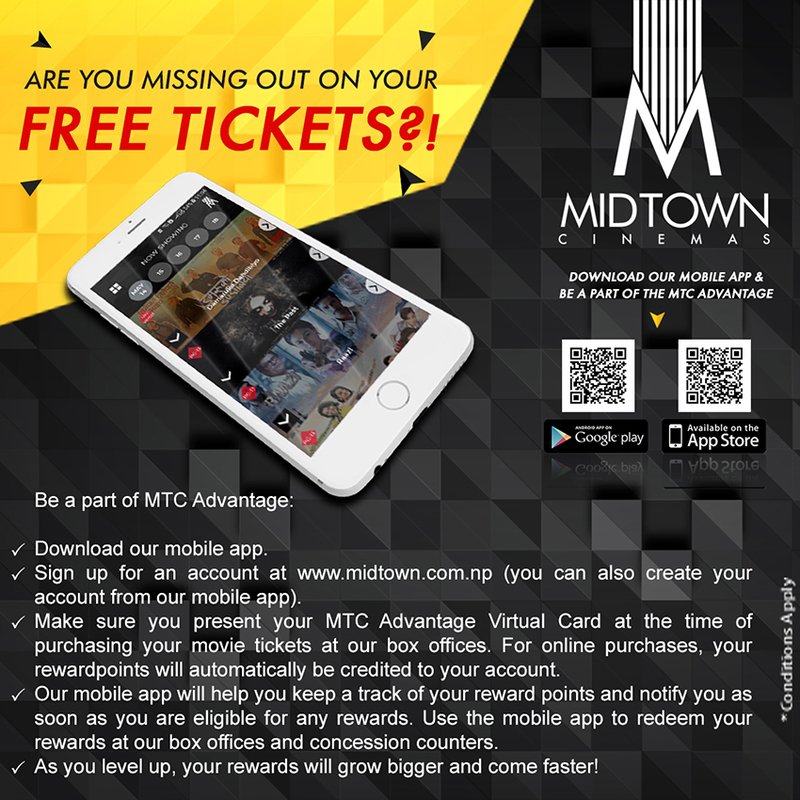 Log in to the MidTown Cinemas mobile app on any device to be a part of the MTC Advantage. The mobile app will provide you a virtual card with which you can keep a track of the current rewards, and the next qualifying point thresholds. The use of the MTC Advantage Virtual Card/MidTown Cinemas Mobile application constitutes acceptance of all terms and conditions of the program, as amended from time to time, including without limitation, all terms and conditions of the agreement. Mid Town Galleria Pvt. Ltd, from time to time, may change the program rules, regulations, benefits, terms of the agreement, conditions of participation and/or point levels, in whole or in part, at any time with or without notice, even though changes may affect the value of the already accumulated reward points and/or status, and/or some or all of the benefits of the program. The MTC Advantage Virtual Card must be presented when purchasing tickets at the box office. In the absence of the card at the time of transaction, the points will not be awarded. Rewards shall expire 90 days from the date of issue. Free ticket Rewards are not valid for 3D movies. The sale, purchase or barter of points, rewards or tickets violates program rules, is illegal and subjects the violator to liability for damages and litigation and transaction costs. Violators will have their accounts terminated; all rewards and benefits received by the violators will be forfeited and will be subject to prosecution. Improperly obtained vouchers, tickets and/or rewards are VOID and will be confiscated. are nontransferable to any other account under any circumstance. may not be offered for resale. are not redeemable for cash under any circumstance. Entities or persons intending to use or using the program for profit are not eligible to become or remain members or to accumulate rewards. Membership is intended for individual use only, and is not available to organizations, legal entities or groups. Abuse of the program, including failure to follow this agreement, may result in cancellation of the member’s account, future disqualification from participation and forfeiture of all points, rewards and special offers accrued. MidTown Advantage memberships may be closed and/or reward points reverted due to any type of computer or technical issues that may arise. This would include any type of electronic malfunctions or human error on behalf of the Mid Town Galleria management team. Mid Town Galleria Pvt. Ltd., to the best of its ability, shall attempt to later fix any accounts that were closed due to any of these reasons and reapply any outstanding rewards or points existing at the time the issue arose.